The appeal of delightful scents can’t be denied! From perfumes, to wickless candles, essential oils and room sprays, the popularity of scented products continues to grow. Even if your favorite scent is the smell of a meal in progress or a cup of tea, you’re also likely to have a fragrance experience that allows you to relax and unwind. As you’ve probably found with various scented products, they’re not all created equal. I’m not saying that you have to spend gobs of money on the best products out there, however, you should definitely have an understanding of how certain scented items stack up against each other. Scentsy fragrance products aim to warm the heart, invigorate the senses and inspire the soul. Let’s see how scented Scentsy Bar wax compares to similar store-bought or homemade melted wax products. Although meltable wax fragrances purchased from the store or made at home can be cheaper than Scentsy Bar wax, their longevity and quality simply cannot compare to the lifespan of a single Scentsy Bar wax cube. With Scentsy Bar wax you can reuse each cube until the fragrance is gone, which is likely 3-5 times depending on how long you keep the wax warmed. And, each Scentsy Bar package can last up to 60-80 hours of “on” time in your Scentsy warmer! 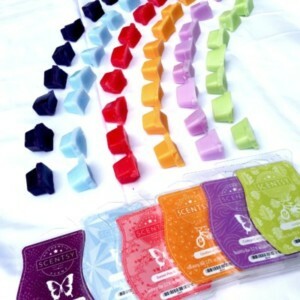 In terms of safety, Scentsy Bar wax melts at a relatively low, gentle temperature when compared with store-bought alternatives. In fact, if you try to melt low-quality, store-bought or homemade wax in a Scentsy warmer, the wax may not even melt! This low melting point, and lack of flame, makes the Scentsy warmer and Scentsy Bar products a safe alternative to both traditional candles and the wax melting process associated with any in-home wax melt making process. In addition, Scentsy Bar products do not contain toxic VOCs and comply with all EPA regulations. At any given time there are more than 80+ different Scentsy Bar scents available, not to mention the numerous seasonal, special scents and re-released scents offered throughout the year. With a store-bought alternative, you’ll never have access to as many unique fragrances. And, while in-home wax making efforts can allow for the creation of custom scents, you can just as easily achieve this goal by combining different Scentsy bar wax cubes. Scentsy warmers come with a lifetime warranty when they are used properly. All other Scentsy products, including Scentsy Bars, come with a 30 day satisfaction guarantee! This type of warranty is almost unheard of in the fragrance product industry and truly demonstrates the quality of the Scentsy solution line of products along Scentsy’s commitment to the customer. With homemade wax melts, you’re never quite sure of the chemical properties of the wax and oil fragrance in the final product, so attempts to warm or burn these products in any device could easily result in combustion or similar disaster. Scentsy fragrance products are found in numerous forms. If you haven’t yet explored the Scentsy product line, you’re missing out on one of the most enjoyable fragrance experiences on the market!